So I’ve been listening to one of my favorite podcasters, Cliff Ravenscraft, talk about how he’s getting back into journaling. Truthfully, that was a foreign concept to me but, for whatever reason, I had in the back of my mind to find an easy app and give it a try. Hey, I’m an open-minded guy if there’s a chance it can help me get the job done, I’m game. That job, as it turns out, is to get my mind right. I have enough thoughts and ideas flowing through my unorganized mind to slow a decent computer down to a crawl and that’s exactly how my brain seems to be handling it – slowly. Bogged down with fragmented bytes of data scattered on an already taxed hard drive. In the past I’ve written my thoughts, ideas, and “to-do” lists in Evernote or whatever piece of paper I can find. I hate to admit it but I’ve even been known to jot something down on my hand at a stoplight while driving somewhere. So I found a cool little smartphone & desktop app that works perfectly for me. I installed it on both of my phones, my laptop and desktop, and even my Nook. What sold me is the desktop version because I like to use a keyboard for most of my writing. Being mobile as well, I also tend to write down everything as I think of it rather than trying to remember it later. I am putting the urge to “jot it down wherever” into my unorganized past and use my new process exclusively. A New Year, right? The app is called Diaro and it works on Android, iPhone, and like I mentioned, any web browser. Diaro also seamlessly syncs and backs up to Dropbox. I think you might have to upgrade to pro for it to backup to Dropbox, which I happily did for just a one-time cost of $3.99 (total – not per device). Me being me, it wasn’t enough to find a great tool, learn to use it, and even blog about it. I had to roll it around in my hands, squeeze it, feel it, and try to shape it into something it wasn’t meant to be. Diaro says it’s designed as a diary, journal or for notes. You might argue the idea that it’s a productivity app because it doesn’t come with the cool features that allow you to “check things off” or easily prioritize tasks, or hell… even have tasks at all. So, obviously, it’s not a real productivity app but it has effectively worked as a productivity tool for me. The point is, I think, to find what works best for you and get more done. For me, it’s the simple things that seem to work best. So being a blogger at heart, I can’t keep anything to myself. It’s just in my DNA, as Gary Vee would say$. So I took my Journal/Diary app and put the content into the open web in the form of, dare I say a blog? That wasn’t a tough decision as far as sharing the content because I took something as sacred as recording my deepest and most honest thoughts into a secret diary and twisted it into a productivity tool. Again, my DNA. I won’t apologize. And that’s about as deep as my thoughts get anyway. Now I needed an easier way to post my unperfected and unedited thoughts without logging into a WordPress dashboard if this project would have half a chance. No problem, with the help of the WordPress plugin JetPack and another free app called Gmail, I’d just write myself an email whenever the idea tickled my fancy. The case study comes in multiples but the primary test is to see if Google finds value in my very short notes without obeying any of the standard SEO routines we practice. Other tests come with apps and tools that I wouldn’t normally use for a blog. I had a domain lying around collecting dust; many of us do, so I thought I could turn the entire idea into a case study. What if I just wrote to myself, not an audience or even Google? That way I wouldn’t have to worry about spelling, punctuation, structure, metadata crap, or even images. Sounds pretty freeing, right? I thought so too. How many distractions do you see in this photo? Picture this, I’m sitting here at my desk (fully clothed – trust me), working on the massive task of migrating my entire email list from AWeber to GetResponse$ (You can bet I’ll be blogging about that very soon), when my brain wants to start getting all creative on other ideas – unrelated ideas. Yep, my mind sees I’m working hard in my brand new Get Response dashboard and says, “Hey Brian, what about LeadPages? I have a couple of really cool landing page ideas“. Knowing my mind pretty well, I knew he wouldn’t let up until I pull the ideas from his tiny little hands because he’s going to be so afraid he’ll forget he won’t give me a 100% on the task at hand. Before, remember, those ideas would have gone into Evernote or a notepad, or somewhere else and I may never see again. Or worse, find it and wonder what in the world it’s about. Have you ever done that? Write a note only to find it impossible to understand later? All I do now email myself a note, which in turn was sent to my “Productivity Journal” in real time, and I got back to work. Yep, I can feel the stress relaxing to bearable levels again and I can’t think of anything better for our creative ability than being able to relax and concentrate without nagging little distractions forcing their way into our immediate thoughts. Logging it into reality, for me anyway, puts a lid on the distraction. 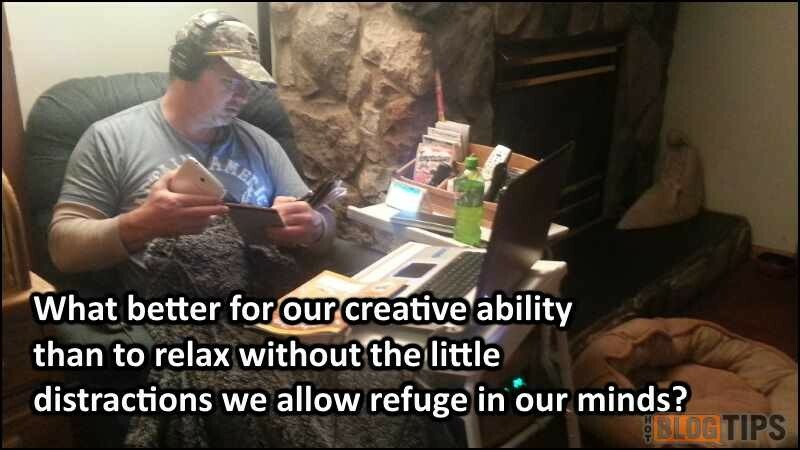 What better for our creativity than to relax without the distractions we allow into our minds? The next thing I knew, my email list was shining with pride, I had several landing pages developed, and had moved onto the next big project – a branded URL shortener and tracking system (Thanks Mike Allton) – which is also in the “done” basket. Another real benefit of logging into a productivity journal, whether using an app or a blog, is the content becomes an archived log of events that is easily searchable. In my case, it’s searchable within the app, my Gmail account, or the interwebs. When I want to know what day I left AWeber, what resources I used to create my branded tracking domain, what I did to fix my Chrome browser, or any future project, it’s all there in one or more databases waiting for immediate recall. With the way my memory works, that’s a big deal. I couldn’t tell you the year when I started trying a new plugin, changed WordPress themes or where I looked to find a blogging solution. This process will save a ton of time when it comes to looking back on past projects. I’ve already noticed a HUGE difference in the amount of browser tabs I have running or how less often I save a page to my Pocket app/extension. Oh yeah, and don’t be afraid to write to yourself.